Yesterday I posted about the mysterious creature – the Sanddollar. Today as I get myself psyched up to be able to better find the dead seashells, I am getting a jump start on how to preserve them. Let me please put out there for anyone ready this…Don’t be a dumbass and take a live one. Live creatures are meant to stay in the sea. Also check with the local authorities at your beach about rules regarding collection of sea shells. So first off, find a bucket for your treasures if you are shore hunting. If you are diving, I have found this to be a whole new issue of getting them back intact. For shore collecting, prepare your bucket for collecting by padding it with rags or paper towels. Before they are preserved, sand dollar skeletons are extremely fragile and will shatter if you don’t provide a soft cushion. For diving, I am thinking about collecting them in a soft bag and attach it to one of my clips. Next, try to visit the beach after a storm or during an outgoing tide. As I stated yesterday Sand dollar skeletons are most likely to wash up on the beach during times when the water level swells. Think treasure hunting. You always see the metal detectors out after a storm. Same principle. Search for and collect sand dollars on the moist part of the shore. Between the rock tumbles and shore. If you are over in Clearwater or St. Pete Beach you will probably have luck just snorkeling or walking in knee high water. Do not look for sand dollars in the water. This is where these creatures live their lives and any you find here are more likely to still be living. Examine any sand dollars you find for a coating of brown hairs, or cilia, looking somewhat like the fuzz on moldy food. Refer back to yesterday’s post. Leave the live guy there. If you see these hairs, you’ve found a live sand dollar and should leave it on the beach. Taking live sand dollars can hurt the animals’ population and doing so is often illegal. Stack your sand dollars on their sides in your bucket if you find a lot of them, because stacking them one on top of another may cause those on the bottom to break from the weight. remember they are fragile and will crumble easy. I have also had people tell me to put a paper towel under them to provide a platform so it doesn’t break. When you are all done transport your sand dollars carefully home. be sure to cushion them. It is so disappointing when you find them to have the sand-dollar just crumble. First, remove your sand dollars and padding from your bucket and rinse it out good. next fill it with clear tap water and put your sand dollars in to soak. One of the keys to cleaning a live sandollar is also very often the least known. In order to get a sanddollar to bleach white it is important to soak it in fresh water first. Empty and refill the water in the bucket periodically. It will keep turning brown and smell bad as the remains of the sand dollar dissolve. Continue replacing the water until it stays clean. You may have to do this for a few days. After you have the smell gone, mix a 33/67 solution of water and bleach, with no more than a third of the solution consisting of bleach. Soak the sand dollars in this for no more than 15 minutes as the bleach can make the skeletons more fragile by partially dissolving them. Start with 5 minutes, less is more. Be sure to hold each sand dollar upside-down in the bleach water to allow it to fill. Next rinse them really good in fresh water again to get bleach off. 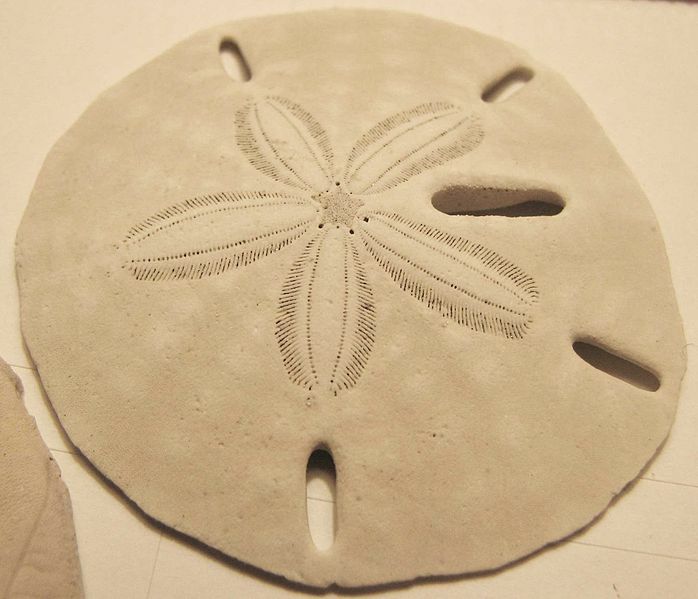 Use a toothpick to clean any remaining hairs from the sand dollar’s mouth (the hole in the center bottom). Allow sand dollars to air dry. For best results, I let them sit in the sun for a day. Mix a solution of one part water, one part Elmer’s glue. Paint this evenly over each sand dollar (do one side at a time) and allow them to dry. I have also used a sponge to apply the glue. It is quicker and not as fiddly. Also does not leave streaks as much. When you are done, you can use them for hand crafted ornaments, curtain adornments or just fill a table side bowl with some other nautical treasures like seaglass and shells. This entry was posted in Creature Feature, Technical tips, info, or other useful thoughts and tagged beach, Clearwater, collect, diving, florida, preserve, sand dollar, sanddollar, sandollar, St. Pete Beach. Bookmark the permalink. You contradict yourself. First you say not to collect live sanddollars, and then you explain how to “preserve” live ones. Noone should collect live sanddollars……….. Examine any sand dollars you find for a coating of brown hairs, or cilia, looking somewhat like the fuzz on moldy food. Refer back to yesterday’s post. Leave the live guy there. If you see these hairs, you’ve found a live sand dollar and should leave it on the beach. Taking live sand dollars can hurt the animals’ population and doing so is often illegal. Why is it okay to pluck live fish from the sea but not okay to take a live sand dollar? If you are diving for them as you stated in paragraph two “For diving, I am thinking about collecting them in a soft bag and attach it to one of my clips” aren’t you indeed taking living ones then? As you stated, dead ones are often along the shoreline and low level water. If you are deep enough to dive then you are in fact catching living creatures. You are very contradictory! I thought it was very informative and I appreciate your care for our ocean and the creatures in it. I found one single huge sand dollar washed up on the beach today . I will try you’re method in preserving it. Thank you. Thank you, Danielle. I found your articles (both of them) most informative and helpful. The information was just what I was looking for…and for those times that you inadvertently grab a “live one” by mistake, it is good to know how to preserve it!!! And folks, this DOES happen mistakenly on occasion, so get over it!! I have a preserved sanddollar that I gave to my dad as a gift after a trip to the OBX. He asked if it is safe to use it as decoration in his bathroom, because of the humidity. Sheesh, sorry for the first few negative responses. I thought this article was very helpful. My husband and I found a sand dollar the size of a quarter today. I’m trying to preserve it to make a necklace out of – if I can get it hardened enough. Thanks for your help. Thank you for this post. I have been researching sand dollars, as I am a novice to the subject and am writing a piece of fiction that involves a scene about sand dollars, and I am also considering getting some sand dollars as Christmas presents, if I can confirm that they were not living when collected. A recent episode of the ABC TV show, “Once Upon A Time” has made me fascinated with sand dollars, so it was great to find this information. People, people….if you are curious enough and patient enough to care about sand dollars (and look up how to preserve on the internet) doesn’t that kind of automatically mean you are a lover of the sea and all it’s creatures? Quit being so snarky! The author is just providing information to all of us!! Danielle, thanks for the information, it was just what I was looking for. I was fortunate enough to find a number of sand dollars of all sizes recently on Anna Maria Island in Fl. I brought them back to ND and am in the process of preserving them. Looked at some of the other how to’s and yours was the one that started by saying what to look for to make sure you didn’t have a live one. I told my husband this is the one I am going to use . Sounds like he knows and cares. I collect DEAD ones here in San Francisco–when I find a live one (as the author explains, they are covered in cilia–you can definitely tell the difference), I give it a good toss as far as I can back into the water. A live one looks very different from a dead one–dead ones are most definitely white (vs. brown or purple in color) and have a smooth, porous texture–kind of like unfired pottery. The author is describing how to de-smell and preserve dead ones. Very nice job, this is the same technique I use. Once I was shelling with my niece, she found all of these great sand dollars (DEAD, of course!) with cool coloring from leaning up against algae and other things–a couple had barnacles on them. I was a ding-dong and didn’t really think about the fact that when we went to bleach them, all the color would come out. She was very very upset and I felt like an idiot. Next time we skipped the bleach and just soaked over and over in soapy water. It seemed to do the trick–no bad dead sand dollar smells. The bleach is definitely faster and for sure the way to go if you want them white.